In yesterday’s post I mentioned the spark that started the French Revolution. Today’s post starts there too. While the sun was setting on the Sun King’s grandson, Louis XVI, a new star was on the rise — Napoleon Bonaparte. With the concept in mind that Egypt would make a fine French colony, and with Vive la République! simmering in their blood, they also had the vague idea to liberate the native peoples from the Marmluke caste (soldier slaves). Napoleon headed there. In the town of Raschid lay a discovery that would change how we viewed Ancient Egypt — the Rosetta Stone. (Raschid was also called Rosetta) Today, July 15th, marks the anniversary of that discovery 215 years ago. A. French soldiers found just lying on the ground. B. French soldiers were extending the walls of Fort Julien and found it then. However it was found, the person who did the finding that July in 1799 was Pierre Francois-Xavier Bouchard, Napoleon’s officer of engineers. He sent the slab to the Institut d’Egypte in Cairo along with other antiquities turning up now and again. After Admiral Nelson won the day in the Battle of Aboukir Bay, better known as the Battle of the Nile, France left Egypt in defeat and the Rosetta Stone made its way to London in 1802. 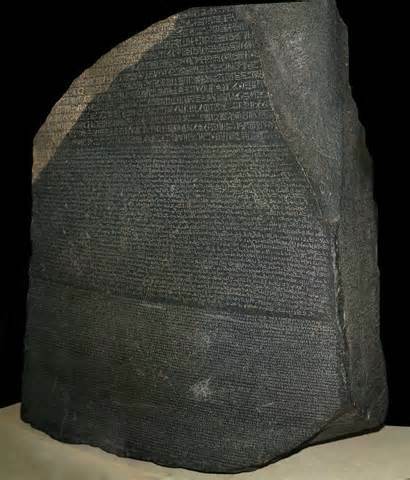 The Rosetta Stone is a stone slab, a piece of a larger stele, inscribed with a decree from the time of King Ptolemy V (196 B.C.E.). The inscription was obviously meant for everyone living in Egypt at the time because the same information was written in three languages — Demotic (discovered to be a common document script), Greek (that every university student knew), and Hieroglyphic (a total mystery). By comparing all three languages and leaning heavily on the understandable Greek, scholars realized the Egyptian pictures went in bunches or cartouches. These cartouches basically amounted to words. What made this an amazing find is up to that point, Egyptian hieroglyphs were seen as just a bunch of decorative pictures. So many precious artifacts were plundered from ancient sites around the world by the people who occupied them in centuries past. Needless to say, Egypt wants it back. For 100 days, I’ll post something from my chosen topic: Clichés. There are 70 entries to come. This entry was posted in Past Posts - you'll never know what you'll find and tagged Ancient Egypt, Battle of the Nile, Colonization, Egypt, Fench Revolution, Napoleon, Napoleon Bonaparte, Romance, Rose Anderson, Rosetta Stone, The Rosetta Stone, Victorian era. Bookmark the permalink. Great post, Rose – I love anything to do with Ancient Egypt and this kind of thing. Been away the RNA conference so hadn’t been keeping up with blogs the same way for a while! The Rosetta Stone is something I’ve been interested in for a long time. I read the articles you linked. One of them had a link to an article about women’s rights in ancient Egypt. It seems wealthy women did quite well and even women who worked outside the home received that same pay as their male counterparts. There was a saying don’t take your women to court because they had the right to represent themselves including the right to dissolve a marriage. I would like to read more about that. The mention of Admiral Nelson reminds me of being able to tour the HMS Victory and then have lunch in the CPO Mess. The Victory is still in commission in Portsmouth, UK. The first visual that comes to mind when I think of Nelson or the Victory is where cannons were fired there are still blood stains. While on board we participated in the Tot Ceremony in which British sailors are issued a Tot of rum at which time there is a toast, the exact words I don’t remember. One subject that has always interested me was the role of women in Minoan Crete. You always leave something to research in your blogs. One of these days I’m going to do a post on the Minoans just for you, Ray. It interests me too. I like info so if in my own info gathering I come across interesting links to follow, I’ll share them too. I’m glad you like that.